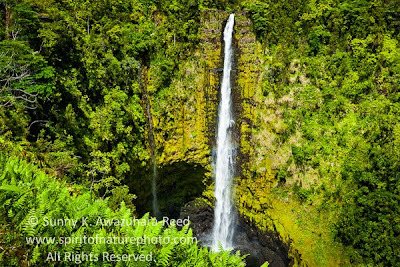 Nature on Hawaii Island (Big Island) is diverse; sunshine beaches, volcanic landscapes, rain forests, and a 13,803 foot high mountain. The east side of the Big Island is located in the rain shadow with annual rainfall 150-250 inches. Abundant rain falls and with its year-round warm climate, the vegetation grows very well. 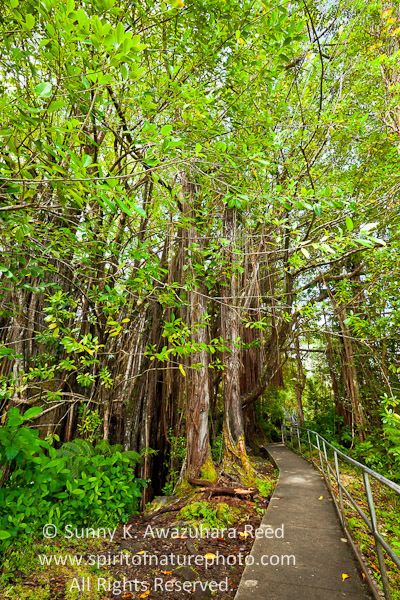 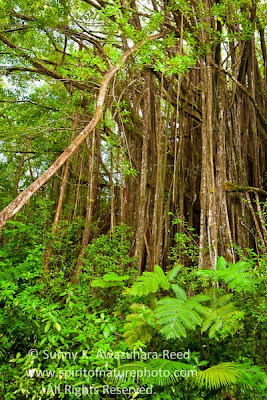 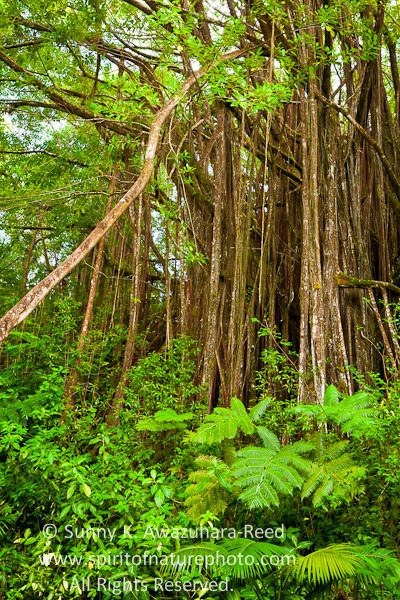 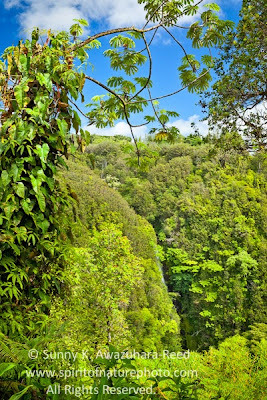 The thick greens of the rainforest which includes typical jungle trees with draping vines; banyan trees, palm, ferns, and mosses cover the area. 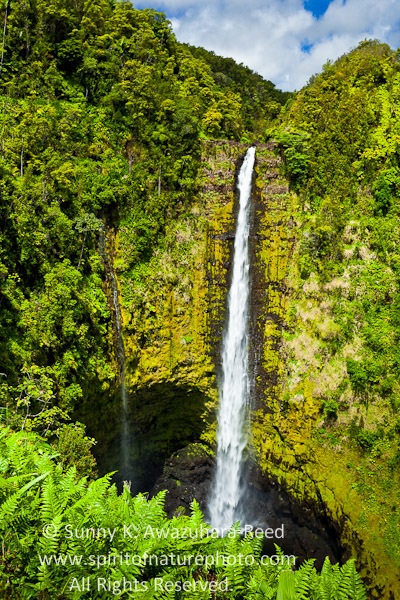 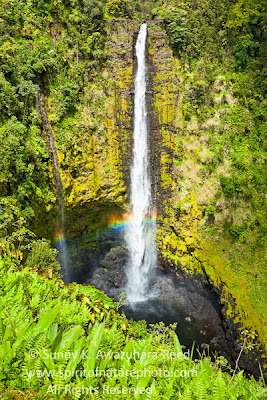 100-foot Kahuna Falls are cascading through lush green cliff. Beach is nice, but I'm more attracted to unique natural landscapes on the Big Island of Hawaii. 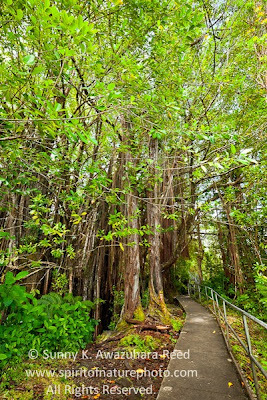 When I got back from Hawaii in early June, Spring had finally arrived in Alaska. 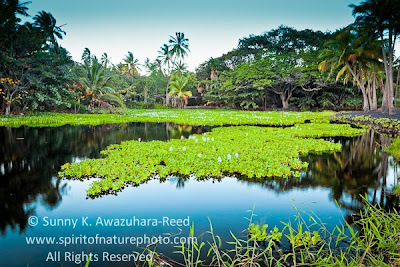 Green vegetation was a welcoming sight. 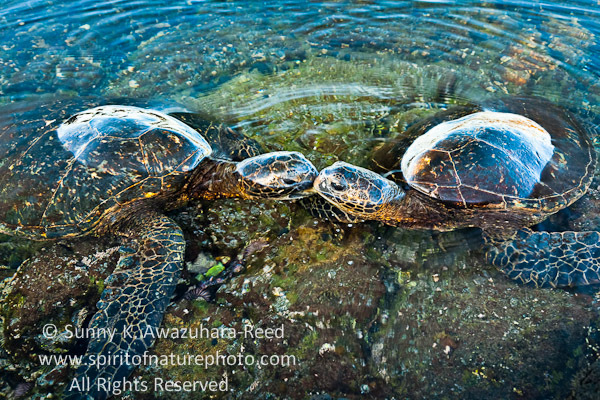 Summer is the most beautiful time in Alaska and a busy season for a nature photographer. I'll share some of new photos from Alaskan wilderness on the next posting. 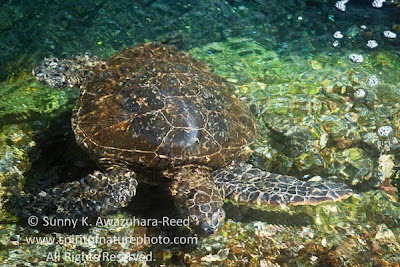 The Hawaiian Green Sea Turtles ("Honu" in the Hawaiian language) are sacred creatures in ancient Hawaiian legend, and a significant symbol of the Hawaiian Islands. Native Hawaiians worship the Honu as their ancestral spirit guide whose wisdom protects and leads them throughout their lives. 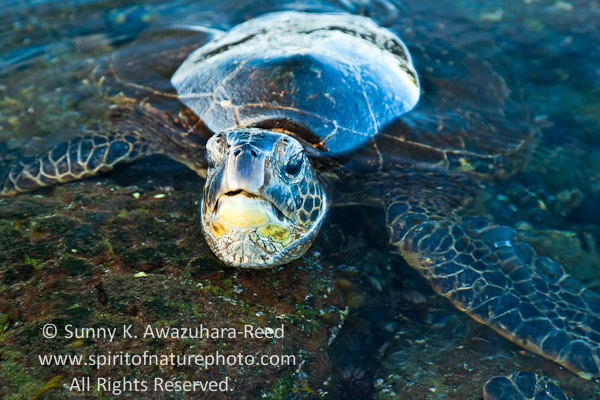 Hawaiian Green Sea Turtles are protected under the Endangered Species Act. 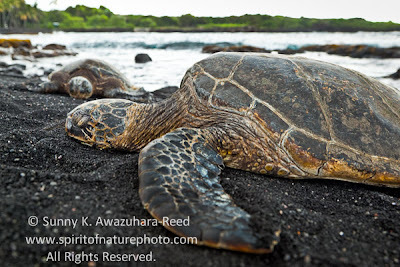 Punalu'u Black Sand Beach on the Big Island is one of the spots where you can find those Green Sea Turtles out basking on the beach. 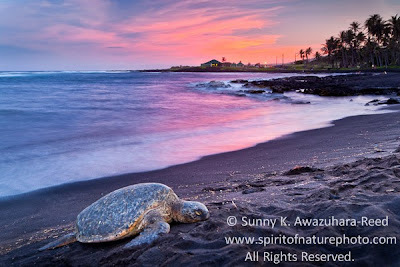 It was in the evening when I first saw two large turtles laid out on the shore, mostly with closed eyes, and stayed at the same spot overnight. They are huge; a typical adult green sea turtle has a outer shell length of 40 inches and can weigh from 200-500 lbs. Their life spans around 70-80 years! 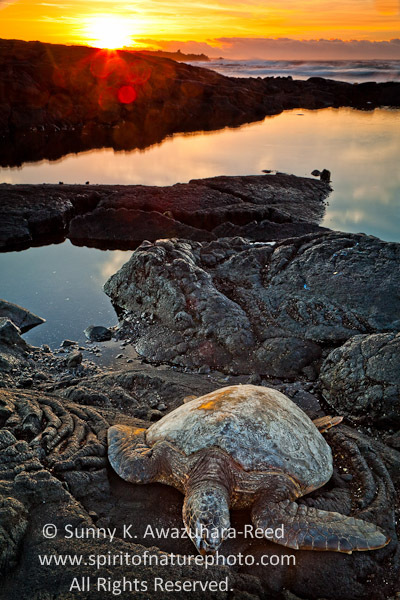 This huge turtle was sleeping on this rock until sunrise. 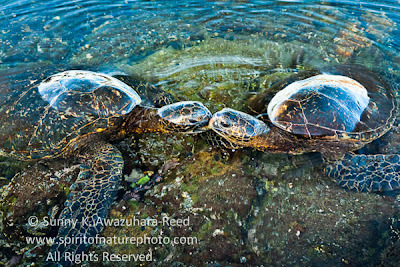 Some turtles were stuck in the tide pool... 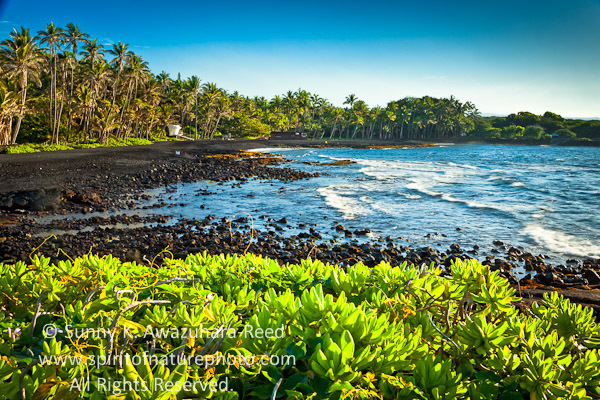 They were waiting for the incoming tide to opens up the waterway to the sea. 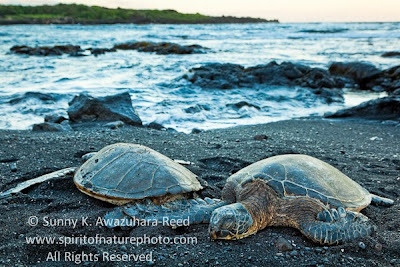 Besides the turtles presence, Punalu'u Black Sand Beach has a magical atmosphere; the jet black sands, formed from the volcanic lava, surrounded by picturesque coconut palm trees. Behind the beach lies a freshwater pond with water plants adding yet another interesting landscape.